The Academy's choral team onstage and owning it at last year's innaugural concert, Disney Mania. Full house and fully engaged audience at Arts United's ArtsLab. Doing Disney, the L.A.D.A. way! 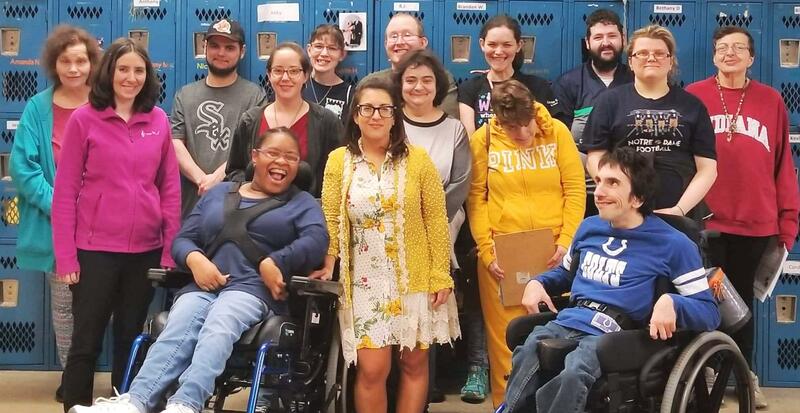 A school where learning is adapted to an individuals unique skills, the academy's mission is to create an ideal place to learn, socialize, and find acceptance. Choral director, Heather Palmer (front row, far left) and program director, Jeannette Iglesias, (front row center) with this year's choral team, taking a break after their final rehearsal. Earlier this week, WBOI's Julia Meek invited Academy program coordinator, Jeannette Iglesias and choral director, Heather Palmer, into the studio to discuss the school's mission, the project's impetus, and what impact a program like this can make. Listen to the extended version of Julia Meek's on-air interview with Jeannette Iglesias and Heather Palmer about L.A.D.A. 's music program, and upcoming presentation. For more information about the event and the Academy, visit L.A.D.A. 's Facebook page. Input Fort Wayne is a weekly, online magazine that's been focused on the innovative aspects of northeast Indiana since its startup in January of 2018.